These small robots don’t like each other, or the walls of their enclosure, and they certainly don’t like humans. As part of the Digital (Dis)connections: Ai Weiwei Late event at the Royal Academy of Art, Alex May and Anna Dumitriu exhibited their robot companion HARR1 (Humanoid Art Research Robot #1) who delighted visitors by getting bored of them (read more here) and a pen of small robots that continuously circled around and bumped into each other. These ‘antisocial swarm robots’ had been programmed to use their ultrasound detectors to measure if any physical object was in their ‘personal space’ and if found, they turned and moved around to try and get away from it. They didn’t like each other, the walls of the pen, or the visitors efforts to interact with them. 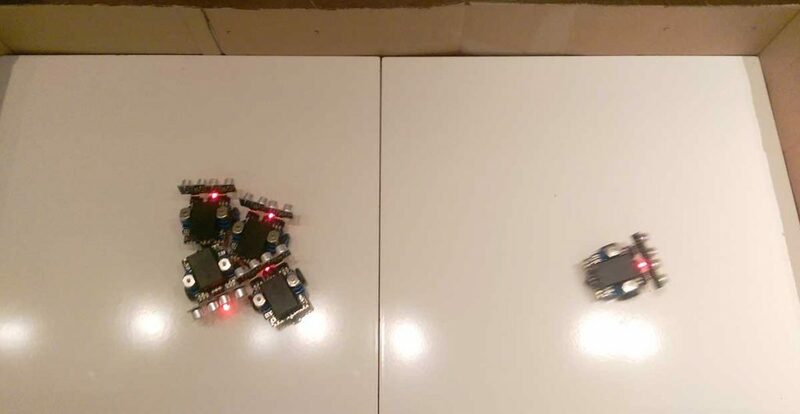 While the code running on each robot was the same, the emergent behaviour became complex, almost predatory, as robots who bumped into each other in their attempts to get away from something else managed to disable each other by shorting out the exposed electrical connections on the circuit boards. On more than one occasion, a robot would lose one of its ultrasound ‘eyes’ in a collision with another. Visitors commented that they were like little creatures, including crabs and mice. Some found them cute, and asked which one was the favourite. Occasionally a robot would get stuck in a corner and a visitor would feel sorry for it and help them escape. One person stroked one of the robots on the top of its battery pack. 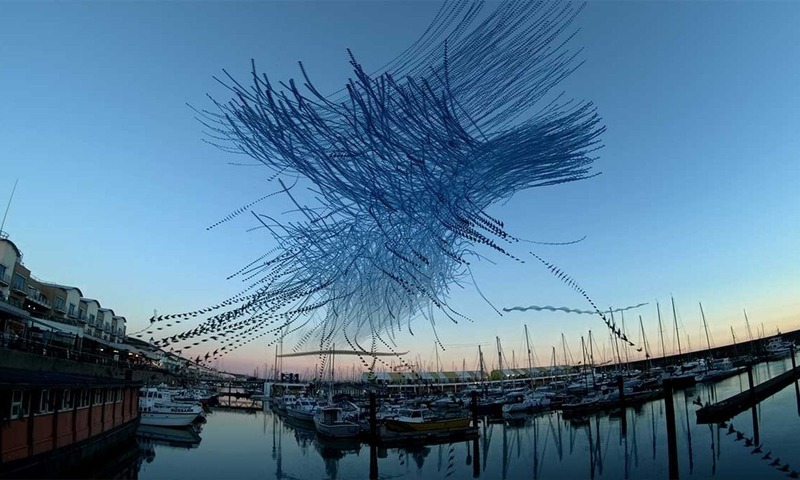 As artists, we were more interested in the reactions of the human visitors to the robots, rather than the behaviour of the robots themselves. 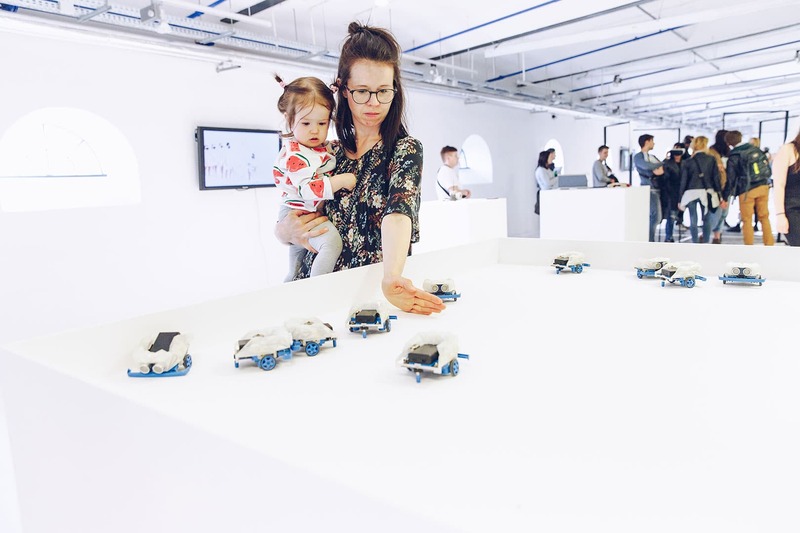 With simple off the shelf robots and a short piece of code, we were able to create mobile objects that exhibited behaviour that humans could easily relate to, many suggesting they were like little commuters in rush hour. 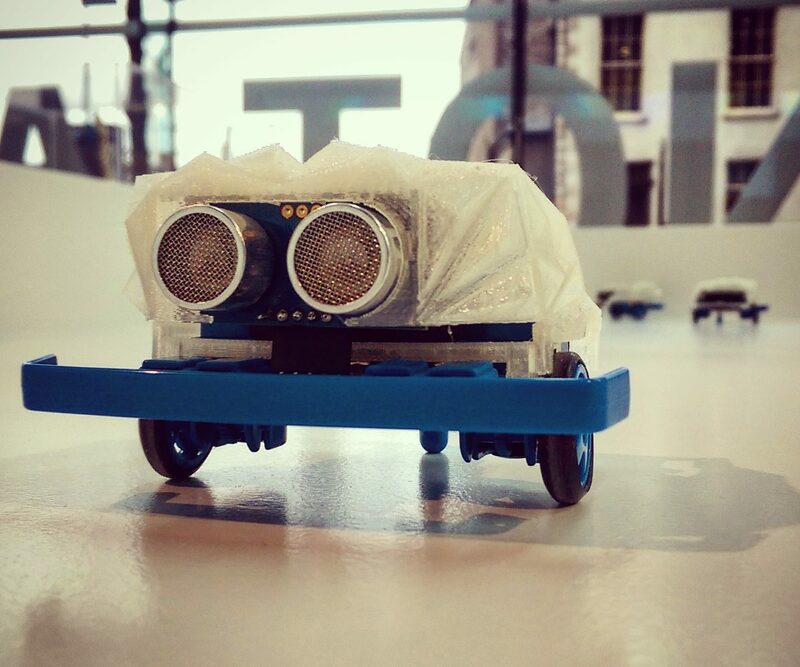 The robots were funded by the University of Hertfordshire as part of Alex and Anna’s artist residency.